Fabien Frydryszak's youth international basketball season got off to a flying start with a clean sweep over Germany in a three-match series. However the French team made more news about their singing and dedication to the French senior team on facebook to show their support for the EuroBasket campaign 2013. The French U15 players are in the first phase of their preparation for the partnership tournament "tournoi de l’amitié " to be held in Greece from 26 until 28 July 2013. This annual tournament which is restricted to the U15 age group, created in 2008, is shared between the basketball federations from France, Greece, Italy and Spain. In 2012 France hosted the tournament which was won by Spain. Fabien Frydryszak nominated 14 players for this camp which ended with a 3-game series over Germany. The German delegation was led by Alexandra Maerz who is also the head coach of the German women national team. 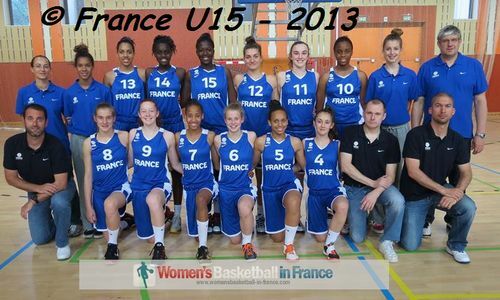 The French team dominated the first two games and won comfortably (74-57) and (60-47). The final game turned into a youth international basketball classic with France escaping with another victory in overtime (71-66). Germany actually handled the ball better in game three with less turnovers and got a mircle shot by Luana Rodefeld to force overtime. The week's training camp for both teams ended positively and promises a bright future for the two nations if they continue improving. The following players represented Germany: Kira Barra (TV 1872 Saarlouis), Flavia Behrendt (MTV/BG Wolfenbüttel), Patricia Broßmann (ASV Moabit Basketball / TuS Lichterfelde), Sunniva Ferri (TSV Theresianum Mainz), Johanne Gröning (ChemCats Chemnitz), Cherina Kaiser (Osnabrücker SC / OSC Junior Panther), Jule Kassack (Herner Turn Club 1880), Johanna Klug (TSV 1861 Nördlingen), Magdalena Krajinovic (TS Jahn München), Annika Küper (Metropol Girls / Citybasket Recklinghausen), Luana Rodefeld (TSV 1883 Grünberg / Team Mittelhessen), Satou Sabally (TuS Lichterfelde), Leonie Schütter (TSV Hagen 1860) and Anna Lappenküper (Herner Turn Club 1880).